If Bill Gates Made Cars. A friend emailed this to me the other day. There’s no real validity to any of it (it’s the mutated offspring of a simple joke), but it still made me laugh; and we can all use a good laugh. 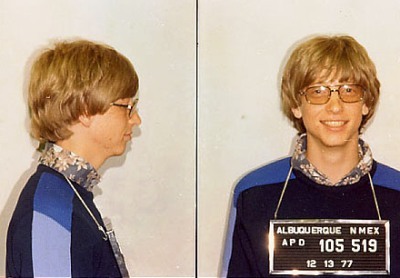 In 1977 Bill Gates was picked up by police for a traffic violation – the details of which are unknown to us because the records have been lost over time. How convenient Mr. Gates. previous post: Lindsay Lohan. Off The Hooch And Ready To Work. next post: George Clooney Is NOT Engaged. An airbag is a vehicle safety device. It is an occupant restraint consisting of a flexible envelope designed to inflate rapidly in an automobile collision, to prevent vehicle occupants from striking interior objects such as the steering wheel or window. 51 queries in 0.605 seconds.